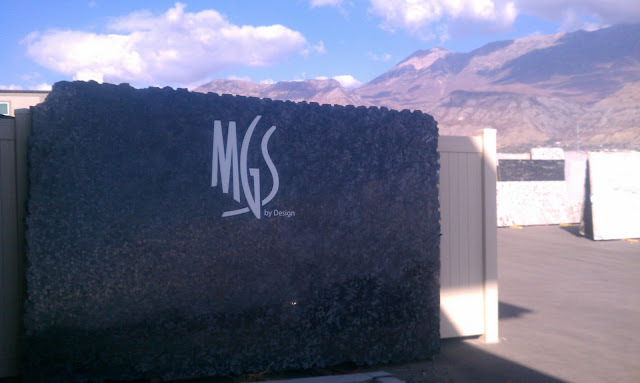 Today I'm featuring a granite color that I just love.... Meteorus. Meteorus is quarried in Brazil. When you look at it from far away it basically looks black with silver. If you get up close or the sun is shining on it just right though you can see all the beautiful detail in this stone. The background is a silvery black and then it has these beautiful purple/red spots of garnet in it. I really like this color with a Brushed Finish as well. It ends up looking really soft and beautiful. Meteorus is a stone that is more difficult for fabricators to work with due to the varying hardness of minerals within the slab. Be sure to hire a reputable and experienced fabricator if you select this granite. Notice the sink in the photo below. It looks like it is custom made out of the Meteorus granite. I love the description that the website of the photo below gives Meteorus... "close up it is black, grey and silver with layers of what look like bamboo shaped leaves cris-crossing. To top it off there are cherry red berry shaped flecks throughout. It’s like on of those Japanese screen paintings made by some Zen master with a sweep of a brush stroke. Stunning!" Meteorus is available in 2 cm and 3 cm slabs.